Elephant seals are marine mammals. Marine mammals of the world are a very interesting group. They include the Pinnipeds (seals, sea lions and walrus's), Cetaceans (whales, dolphins and porpoises), some Carnivora (sea otters) and the Sirenia (sea cows). The pinniped group is divided into the true seals, or earless seals (Phocidae), the sea lions, or eared seals (Otariidae), and the Odobenidae (walrus group). The elephant seal is a true seal (Phocidae) with two living species (the northern elephant seal and the southern elephant seal). The southern elephant seal is the largest Pinniped on Earth. It is also a very interesting species as it comes ashore twice a year - once to molt and once to reproduce. If its beachings are near populated areas, this allows easy viewing by humans of an extraordinary species. Those of you who live in California can view the northern elephant seal species easily in central California nearly year-round. 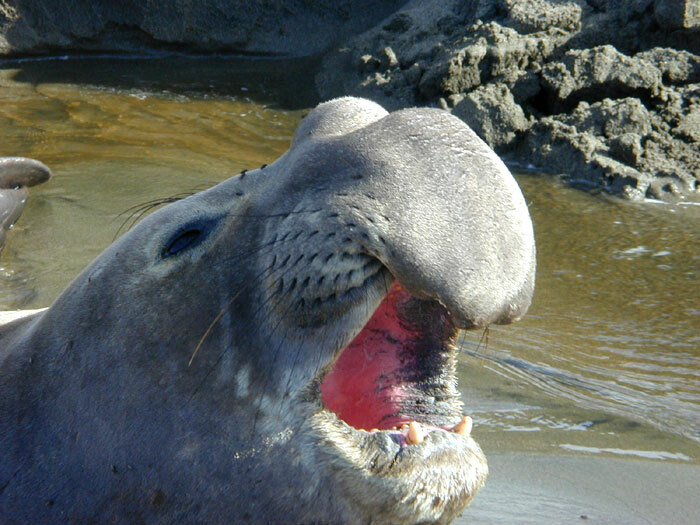 The following lessons are prepared to give you an in-depth look at the elephant seal. Most of the photos of the northern elephant seal were taken at San Simeon, California, and all of the photos of the southern elephant seal were taken at Hannah Point, Antarctica.